To celebrate the release of 'Our Arkhamverse' we're giving away some great prizes, in-return we're asking for some great fan fiction! 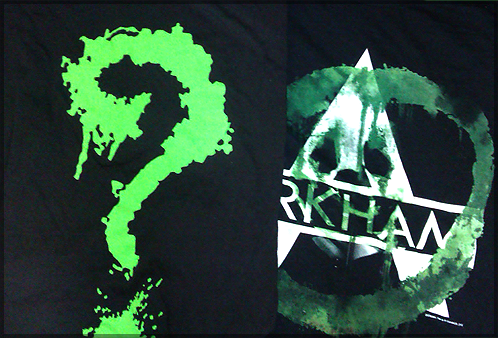 To stand a chance of winning these awesome prizes simply write a short Arkhamverse story and post it in our new sub forum, 'We Run Arkham'. Please include '[Short Story]' in the title so we can spot your entries! Any short story posted in the sub-forum from now, till March 30th will be automatically entered into the competition! We'll announce a winner and four runners up on March 30th. The winner will receive three prizes (your choice!) while the runner's up will receive one each! So what are you waiting for? Let's get writing! You must be a member of ArkhamCity.co.uk to participate in this competition. Your short story must be a minimum of 100 words. Your short story must be a maximum of 750 words. Your short story must be based in the Arkhamverse. Your short story must be your own work, plagiarising other peoples work will result in a permanent ban. Would you ship to Puerto Rico if I win a shirt. Does it need to be fully based in the Arkhamverse? but you could just not make mention of any Arkhamverse events or characters? Thegoddamnbatman wrote: Does it need to be fully based in the Arkhamverse? Yes it has to be based fully in the Arkhamverse. KnightEdge wrote: Just a question: Would you ship to Puerto Rico if I win a shirt. You could always try and shrink it. Yes!!! I feel bad for Luke, it must take days to read all of these. arkhamcitydood wrote: Yes!!! I feel bad for Luke, it must take days to read all of these. I'm actually really looking forward to reading them! Also. how do we title it? Do we write in the title or whatever that this is for the competition? arkhamcitydood wrote: Also. how do we title it? Do we write in the title or whatever that this is for the competition? In the topic title put [Short Story]. Alright. Thinking mine through now. Thanks man. The shirts look so badass! Just your name and address so we can send it to you!